Wine is processed in a modern distillery. internal damage to the human body. As a result, alcohol is no longer regarded as a medicine. Distilled alcohol, also called "spirits," contains 40 percent to 50 percent alcohol because the distillation process concentrates the alcohol by removing the water. To make distilled alcohol, a mash of grains or fruit juices is prepared and fermented. The mash is heated in a boiler, causing the alcohol to boil away. 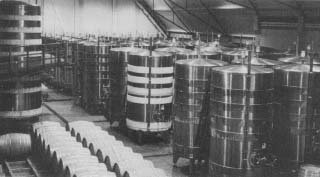 The alcohol vapors are collected, then cooled in a condenser. The Romans are credited with discovering how to distill alcohol. They called the final product "aqua vita" or "water of life." Distillation for medicinal purposes probably began in the early twelfth century in Italy, when wine was distilled to produce brandy. Distilled alcohol has been used as an anesthetic (a drug or preparation that produces unconsciousness or increased insensitivity to pain) and as a wound cleaner and antiseptic (a substance that cleans and sterilizes by stopping the growth of microorganisms on body tissues and surfaces). Distilled alcohol's purity makes it a good preservative, and it is still used in liquid medications. Distilled alcohol's use as an anesthetic is based on the effects it has on the brain, including relaxation and insensitivity to pain. Because the anesthetizing effects of alcohol are less predictable than the drugs available to modern-day anesthetists, alcohol is no longer used professionally to anesthetize patients. Other former medical uses include adding distilled alcohol to intravenous solutions (IVs) to provide calories to patients, a practice that has been stopped as doctors have learned more about the toxic effects of alcohol on the human body. Distilled alcohol exists in an undrinkable form called industrial alcohol, which is used in the manufacture of thousands of goods. Most industrial alcohol is now made synthetically from natural gas or petroleum gases. This class of alcohol includes isopropanol (rubbing alcohol), used to clean wounds and skin and to cool the skin. I have been suffering from lethargy and trouble waking up in the morning for a couple of years now and i have been suffering from Raynaud's phenomenon and migraine's for about a year now. I have found however if i drink a glass of wine before bed i wake up no problem and don't suffer from Raynaud's or migraine. I hardly ever drink (maybe one glass every two months or so apart) which made it easy for me to remember the few occasions i have i felt better. Is there an explanation for this? if the romans diluted their wines up to 90%;but usually 3-4 times weaker then one can only assume they knew how to distill spirits. They knew how to make brandy.